There is a bakery near my house that serves the best brownies! One of my favorite brownies has the creamiest peanut butter frosting and I knew I had to recreate it at home! 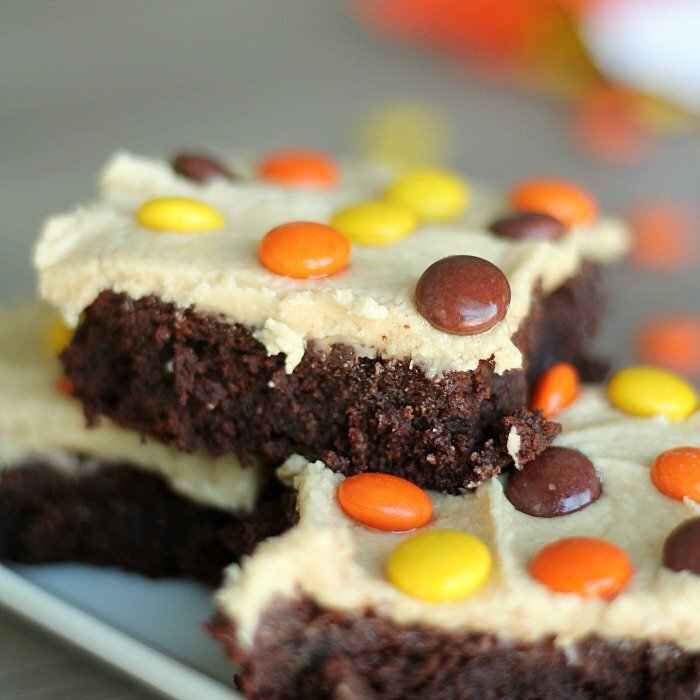 These brownies are so fudgy and the peanut butter frosting puts them over the top! In a large bowl, combine butter, sugar and vanilla with a hand mixer until smooth. Stir in flour, cocoa and salt until combined. Bake for 25-30 minutes or until a toothpick comes out clean. Let cool completely. In a large mixing bowl, cream butter and peanut butter together until light and fluffy. Add powdered sugar, milk and vanilla and beat until well combined. Spread over the top of cooled brownies and sprinkle with Reese's Pieces. Looks great! I'll make your recipe right now. Thank you.